If there’s anything we like to cover besides net/nets here at Cheap Stocks, it’s real estate, more specifically, companies that own relatively large amounts of raw land, commercial property, or a combination of the two. My portfolio is chock full of these companies, from retailers such as Cabela’s, to restaurants (Cracker Barrell, Denny’s) to shipping companies (Alexander and Baldwin) to agriculture (JG Boswell and Limoneira), to name just a few. Over the years, I’ve also sold out of some names as well. Maui Land and Pineapple (MLP) is a great example. I continue to follow the company, however, looking for a re-entry point, or making a determination of whether I want to take a new position. MLP, which owns 24,500 acres primarily in Maui, Hawaii, including 10.6 miles of ocean frontage with 3300 of lineal feet along sandy beaches, has fallen on hard times during the recession. The company recently reported a $54 million loss for the second quarter, which included more than $37 million in writedowns, $21.3 million of which represented a decrease in value of the Company’s investment in the Kapalua Bay resort. Clearly, the downturns in real estate prices and resort visitors has been a double whammy for MLP. The stock now trades at $6.22, down 79% from its 52 week high of $29.69. While there is still value in MLP, declining cash ($1.5 million) and debt ($60 million short-term, and $35 million long-term) complicate matters for this $50 million market cap company. Some recent transactions, however, demonstrate the value of some of MLP’s land. In March, the company sold its Plantation Golf Course for $50 million in cash. (It’s a somewhat complicated transaction, for more detail, see note 9 in the most recent 10Q). On March 27, 2009, the Company sold the land, improvements, structures and fixtures comprising the Plantation Golf Course (PGC) for $50 million in cash. Concurrent with the closing of the sale, the Company entered into an agreement (Ground Lease) to leaseback the PGC for an initial period of two years for an annual net rental payment of $4 million, payable monthly in advance. Concurrent with the closing of the sale, the Company also entered into an agreement to leaseback the portion of the Plantation Clubhouse comprising the retail shop for a period of five years, which will commence when the Ground Lease expires or is otherwise terminated. The Ground Lease requires the Company at its own cost and expense, to replace the irrigation system at the PGC, subject to a cap of $5 million. Because of the Company’s continuing involvement associated with the obligation to replace the irrigation system, the sale and leaseback of the PGC has been accounted for as a financing transaction and, accordingly, the net proceeds received have been recorded as a non-current liability on the consolidated balance sheet and no gain will be recognized until the irrigation system replacement project has been completed. In consideration for the release of the PGC from the collateral for the Company’s $90 million revolving line of credit with Wells Fargo Bank and certain other lenders, upon closing of the sale, $45 million of the net proceeds were used to partially re-pay borrowings under this line and the credit limit available under this facility was reduced to $45 million. In March 2007, the Company sold the land underlying the Ritz-Carlton, Kapalua hotel – 49 acres – for $25 million in cash and a 21.4% interest in the Hotel JV. 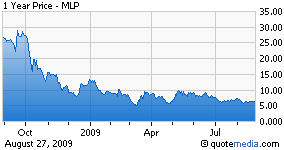 As of June 30, 2009, MLP’s stake fell to 15.9% of the hotel, due to cash calls in which MLP did not participate. A good portion of MLP’s land is preserved, including the 8,304-acre Pu‘u Kukui Watershed Preserve, which is the largest private nature preserve in Hawaii, and the 3,307-acre Honolua-Mokule‘ia Marine Life Conservation District, both located in West Maui. An additional 2000 acres is used in the company’s pineapple growing operation. With a current enterprise value of about $145 million, the EV to acres calculation we are fond of works out to just over $5900. Of course, not all of MLP’s land is as valuable as the ocean front property, and this calculation does include the preserved land. We’ll keep an eye on this company, as it does have its share of issues, but is interesting nonetheless. Keep in mind that average trading volume is just 35,000 shares/day, and Steve Case owns nearly 43% of the shares.